"It was clear from the get-go that Chad's greatest concern was my happiness, that he wanted me to live in a space that not only met my needs but 'felt like home.' It can be daunting when looking at numerous properties to keep details straight and remain objective, but Chad was always there to offer clarity and his own honest appraisal when I sought it. He was someone I knew I could count on while navigating the complexities of buying a home." "Luis was a terrific broker who helped my wife and I find an amazing apartment in the downtown Chicago area. He was really knowledgeable with the surrounding areas and informative on fun restaurants, shops, and nightlife activities. He was very professional in dealing with us, and especially with the other listing agent/landlord by asking questions we may have overlooked or forgot were important in the viewing process. He did a great job of making sure that the experience was fun and headache free, as we were very picky in what we were looking for, and Luis was able to deliver exactly what we wanted. Luis is a fantastic broker and I recommend him to anyone looking for living places in the city. I would happily work with him again if we decide to move in the future!" "Super dedicated team and easy to work with. thanks for all your help!" "To the point where I started to feel guilty, Olin was a constant source of energy and hope, driving us around, sending new properties our way, in constant communication. I truly felt like we were his only priority. I can't imagine going through this without him." "I have unique circumstances due to having a child with special needs that made finding the perfect home difficult. Olin worked extremely hard to find properties that met my needs and was always available to answer questions (as a first- timer, I had more than my fair share) and help me navigate the process. He was courteous and professional and helped get me a great deal on my new house! I couldn’t have done without him!" "In my lifetime my wife and I have worked with a number of very good real estate professionals. We must say that Olin is among the very best. His professionalism, his attention to details, his ability to understand what we were looking for and show us properties that met our criteria was greatly appreciated. We flew in from out of town and had a limited time to view properties. He did his homework and maximized the time we had to see properties that met our criteria over the 5 day period we had. We saw over 47 properties. In the end, we found our dream home but it came down to a competitive bidding situation and his guidance on how to write our offer and help us determine the offer price was what helped us prevail and to get our new home. He was also very helpful during closing and made the whole process very easy. I would highly recommend Olin to anyone looking for a place to call home." "Luis is just magnificent. He is knowledgeable, caring, and a true professional. Luis helped us get our first house- a fixer-upper. As first-time home buyers, it was a pretty stressful process, but Luis made it as smooth as he could. He was so patient with the million questions we asked him. He really went to bat for us as we had to do a few rounds of negotiation after our inspection. He offered constant reassurance and expertise. It was such a pleasure to work with him. I miss not having to text him all the time now that we have our home!" "Olin did an incredible job! In dealing with other agents in the past who were only interested in making a quick sale, Olin was a welcome change and he has completely changed my perception of what a real estate agent does. He answered all questions thoroughly and it was clear he was looking out for our best interests. There were also a few times when the other side of the transaction fell short on getting us info, but Olin stepped up and made sure we had everything needed to make the right decision. Purchasing a home can have its stressful moments, but Olin has a talent to minimize that as much as possible. His guidance was clear, honest, and in the end, made us very comfortable with our decision to purchase. It goes without saying that I highly recommend Olin!" "Olin is incredible! He is so organized, resourceful, punctual, and efficient. He is an excellent communicator and made our first home buying experience a breeze. We bought a fixer-uper, which makes it a slightly more complicated process than if it was a ready-to-go home, and Olin helped us navigate this intimidating process. He is thoughtful and patient with our oodles of questions; its such a big decision! We could not be happier and will recommend him and his team with glee!" "Olin helped us buy a beautiful condo in Lake View. He is beyond helpful, friendly and extraordinary skilled in this industry. I will be recommending him to anyone buying or selling in Chicago. Simply the best!" I'm living in a gorgeous apartment that is so much nicer than what I expected, and fulfills needs I didn't even know I had! Luis worked with me, (put up with me! ), drove me around to see properties, and went out of his way to make sure that I found it — a place to call home." "Olin is incredibly knowledgeable, patient, and responsive. He learns quickly what you are looking for and will not only find you a place you love, but make the process of home buying as painless as possible." "Olin made my first time home buying experience easy and enjoyable. He always did things in my best interest and constantly pointed me to what's next in the process. He did such a great job that I've since recommended him to other friends!" "We sold our old condo and bought an upgraded one on the same day. Olin coordinated everything. He consulted and helped us prep our condo to sell, doing it in 2 days with an offer above the list price. He worked very hard in negotiating our upgraded condo and our move including making our actual move run smoothly. Olin has a decade of experience behind him and it truly shows in his knowledge of the market and thinking outside the box. It's a seller's market so finding the right place is not easy right now due to lower inventory but Olin was able to help us get into the perfect place. I would absolutely recommend his services." "Olin was motivated and helpful, and made the process more lighthearted-which was much needed, given the stress around finding a new place to live. I would highly recommend him!" "Working with Olin was a great experience. He is very knowledgeable as to the market, was very informative and provided guidance and the entire process of listing my current home and purchasing my new home. Olin's dedication to his clients, their needs and follow up is superb. This was my 7th home sale/ purchase and the process was flawless with Olin's assistance." "Olin was incredibly helpful and supportive during the whole process.We did not know what to expect as first time home buyers and we could not have been happier with the service Olin provided. He was a great communicator throughout and kept us at ease during the process. We had many questions and Olin was very responsive and thorough in helping making sure everything was answered. Our experience exceeded all expectations!" "Olin was such a great advocate for us in our search for our first home. He was accommodative to our schedules and always found a way to keep things moving forward. We saw close to 20 condos before we found what we were looking for, yet Olin was patient and helpful throughout the process. I can tell that he is a step above his peers through our interactions with other agents during our search. Nobody worked harder than Olin, and oftentimes he would be doing the listing agents' work for them! We had a fantastic experience and would recommend Olin to anyone." "The best! Honest, not pushy, thorough, completely professional. I recommend him highly." "Since 2013, Olin has discovered three awesome properties for my partner and myself. Two beautiful condominiums and a lovely apartment. He has never let us down and has always made us feel like we were his only clients when searching for a new home or apartment. He is the quintessential professional and he should take great pride in the job he does and the lives he helps people build." "Olin made selling our home a breeze. There were some difficulties in the process, but Olin made it as painless as he could and worked to help in every way possible. He definitely went above and beyond what is required of brokers and I recommend him to absolutely anyone who is buying or selling a home. Thanks Olin!" "Olin made our first experience buying a home in Chicago a breeze. He was professional with a unrelenting energy and effervescence that made trudging in and out of showings a breeze even in the worst of Windy City winter weather! His expertise and service extended far beyond signed contract, as he kept us on task throughout our lengthy close. Give this guy a call! What are you waiting for?!" "Another great experience with Olin! Easy to work with and so helpful with any questions we had along the way. He takes the time to understand your needs and provides great advice." "Olin not only sold out home but he helped us to pick it out and acted as our agent during the purchasing process. Throughout both he has always been professional, responsive and worked to our best interest. While I currently reside in Houston, if the opportunity presented itself and I move back to Chicago, Olin will be one of the first persons I call so we can work together on the purchase of another home." "Olin was great from start to close. He was able to answer every question I had along the way and was always available when I needed him. My husband and I found the perfect house on the very first time out and he took it from there, even when we were out of town. We'll be recommending Olin to anyone and everyone we know!" "As the first home buying process can seem difficult and stressful, Olin was able to help us smoothly navigate our way through this process with ease. He is extremely knowledgeable on the market and was very responsive to our needs. I even had compliments from other people we worked with commenting on how organized and attentive Olin was throughout this whole process. Olin was not only professional and helpful, but he was able to make this process an enjoyable experience for us. I looked forward to all the time we spent looking at places because he is so personable and knew exactly what we were looking for in our new home. I would recommend Olin to anyone who is looking for a knowledgeable, professional, and accommodating broker. Thanks so much Olin! We love our new home!" "Olin did a great job! He had to deal with a tough buyer that was purchasing my condo but did a great job pulling the deal together and getting it done. He was also the realtor on the purchase of my new home. The deal went smooth and we are now living in our dream home! Thanks Olin!" "Olin was great, he provided honest feedback and he was very responsive. He made the home buying process less stressful and less daunting. We would absolutely recommend Olin." "I knew I had some friends that dabbled into real estate, but anyone who knows me knows I am a list guy. And while I can figure out a system as good as anyone, I also hate reinventing the wheel. So when I was deciding on a real estate agent, I asked a couple of friends the first question, why you? Olin replied with his long list of credentials and, Well, along with being a broker I am an ABR, which means Accredited Buyers Representative. I have a proven record helping buyers achieve what they are looking for and I've never had an unsatisfied client. I've been selling real estate for almost 10 years and know exactly how the business works.And, I'm just really cute!!! While there is no doubt that he is really cute, he is also a VERY effective real estate agent. He scheduled a time for us to meet and chat in person so we could establish what I wanted, what he could do for me and how this whole process worked. Like the professional he claimed to be, when I arrived at his office, he had a folder with the lists of everything that would happen at each stage of the process. I could not appreciate that more, as I like to see the path we are going to take and follow along in my hymnal. I gave him specific criteria for what I was looking for, and religiously he was informing me of properties that met that criteria and a few that were just outside, just to see if it might pique my interest. Each time we would go see new condos, it helped him trim down the list of what I did and didnt want and reduced the chances of walking into a place that I just wanted to walk out of. By the time I selected the property I was interested in purchasing, he was already prepared to set up the inspection, the lawyer, the closing, everything that needed to be done, and all I had to do was show up and give my approval to each step and proceed on. Yes, some of those visits were at 9am on a Saturday, but I think Olin regretted those much more than I did. I closed on my first new condo yesterday, and while I have heard the horror stories of signing your name over and over and over again, my own circumstances with the guidance of both Olin and Mario (attorney) had my closing down to 5 signatures and barely 30 minutes!! Everyone has their own level of assistance they need, and you provided just the right amount of hand holding and freedom to let me find the place I hope to call home for some time!! If anyone needs a recommendation on a great real estate agent in Chicago, let me know, and I will point you in the right direction!!" "Olin was very helpful and supportive throughout this entire home buying process. He is professional, and really knows his job. I'm so thankful to have had the opportunity to work with him." "Fantastic!! Olin went above and beyond to sell our home. We could not be happier and would recommend Olin to anyone looking for a top notch realtor!" "Olin is knowledgable and truly cares that you find a home you love. We had a lot of things on our wish list, and it changed regularly. He was accomodating through it all. He even followed up with us after the lease was signed to make sure everything was going well." "Olin was committed to getting me the best bang for my buck which was based on his expertise in the real estate market and keen insight to property potential. Understanding I was a first-time home buyer, he was also very supportive throughout the purchase process. Friendly, energetic and attentive to my schedule and my 'wants' in a property, Olin is highly recommended in my book and would most definitely do business with him again." "Olin was very thorough throughout the whole process. I never felt pressured to purchase one property over another. In fact we had a few hiccups with the property I purchased and Olin was willing to cancel the contract and continue the search for another property. Olin made this process very smooth and went above and beyond at times. I can not say enough about how satisfied I am with Olin and @ properties." "We were moving from out of state and Olin was extremely willing to work with our schedule of visits to the city. We changed the parameters of our search twice and Olin did not miss a beat. He was with us from day one to the closing on the property we finally chose. We would highly recommend Olin to anyone looking to purchase a home." "Olin is the best of the best...I feel extremely lucky to have had the opportunity to work with him. I came into the at properties office on a tight deadline to buy a new home, and Olin did everything possible to help me meet my goals. In less than two months from the day we first met, I became the owner of a wonderful condo in a neighborhood I love. I highly recommend Olin for his great knowledge of Chicago real estate, and in particular his ability to wisely navigate short sale and foreclosure buying processes. He is also a kind, caring and honest person who makes the buying process fun and educational along the way." "I wouldn't have trusted anyone else to sell my home in the dead of winter but Olin knew that he could. The marketing was amazing, his follow up very thorough and he made the process very smooth from start to finish. Thanks Olin!!" "Olin was AMAZING to work with. I was moving to Chicago from out of state and had one weekend to find the perfect home. After looking at 28 properties with him I found three perfect homes!! It make it hard to choose and Olin was patient through the entire process. Once I was under contract, Olin provided me an extensive list of local contacts including everything from utilities to handy men and lock smiths. He was by my side through the entire closing process and also was able to refer me to my inspector, mortgage company and lawyer. One stop for the entire process. Thank you so much Olin!! You're a life saver and great at making my move easy!!" "Olin was extremely professional and as first time home buyers, we really appreciated how thoroughly he answered all of our questions. He was very professional, extremely creative with space and considerate with his time. He is dedicated to a client's search!" "We were really lucky that we were referred to Olin. Our previous broker who we had initially been in contact with was slow to respond and send us requested information. Olin, however, was able to accommodate our unique situation, and set up showings for us the day after we contacted him and was able to help push a quick 30 day closing. Olin's really personable and professional, and has a large list of trusted vendors he's worked with to help with the whole process." "Olin was courteous, timely and professional. He was very knowledgeable in the intricacies of home buying. He was keenly aware of our concerns and promptly offered solutions and action. The best thing I can say about Olin is that he filled us with confidence in our home buying decision and not false confidence in a property. We love our new home. We are excited to live in the former residence of George R. R. Martin and look forward to making it our own "House of Thrones". Yes you read that right, Olin sold us a former residence of the author of Game of Thrones. He was extremely professional, responsive and helpful. He gave us great advice and helped us score an amazing deal on the perfect place. Our whole family are such big fans that the morning after closing our toddler asked to go see his friend Olin and get another new home. Thanks Olin!" "Olin was great...helpful, knowledgeable, and persevering !" "Olin was great to work with! He was helpful in every regard. He was always very responsive and helped facilitate a long difficult process on an REO!" "Olin was a pleasure to work with. He listened and addressed my needs and showed me places that even exceeded these needs. He took the extra time to help me weigh the pro's and con's of different properties and even showed me some extra areas of the neighborhood. All in all it was a great experience." "We had a tremendous experience with Olin. He selected initial properties based on our desires and that initial set of properties was spot on. That made our in-person search fast and easy. We were able to contact Olin with questions at any time. Overall he helped make the process of buying a new home from out-of-town a very smooth process." "Olin made our buying experience very easy. From the beginning he provided recommendations for mortgage brokers, attorneys, and almost anything else we could possibly need. The resources we chose were equally amazing and helped make what can be a tedious process very smooth. Olin regularly checked in with us and kept a line of communication open between all parties to keep our very aggressive closing timeline on track. This combined with his professionalism and approachable style makes him a broker we will recommend to friends." "Olin was wonderful to work with. He is so knowledgeable and a true professional from start to finish. He really did a terrific job marketing and showing our condo for rentals. He handled everything and was patient with us not knowing the in's-out's of renting our property. He knows Chicago and specifically Andersonville-Edgewater. His advice and guidance throughout the process was incredibly valuable. We will definitely call Olin again if we need to rent or sell property. Highly recommend you work with Olin!" "Olin really has his act together. He helped us quickly lock up the precise apartment we wanted while it was like pulling teeth to get other brokers to even return our calls. Since Olin knew what he was doing and was able to discern what we were seeking, it was easy to invest faith in him and the process of selecting a place was incredibly smooth and painless." "The housing market can be daunting. This is the second time we've used Olin to help us find the perfect place here in Chicago -- and I've recommended him to a number of friends over the last few years. If Olin has other clients, you'd never know it -- every call and every showing, he made us feel like we were his number 1 priority. His upbeat personality and knowledge of area neighborhoods is the perfect power play you need to check house hunting off your busy 'To Do" list! Thanks, Olin! We'll be back again soon!" "Olin provided excellent services as a realtor. Throughout the entire process Olin exceeded our expectations. His knowledge regarding real estate in Chicago was incredibly valuable. During the negotiation process, Olin would provide his valuable advice to us and would provide responses extremely quickly. This was our first time buying a home and Olin definitely made the process easier for us. We will refer Olin to all of our friends/family and look forward to using him in our next purchase." "Olin really came through for me precisely when I needed it. He was very responsive to all of my questions and concerns and did a great job explaining the entire process to me. He is very friendly and a real professional. I am grateful for his help and I would certainly feel comfortable recommending him to a friend." "Words cannot describe how lucky we were to work with Olin Eargle. I would highly recommend him to everyone. We were first time buyers and were guided the whole way through this crazy process with such care and professionalism. We were so new to all of this and Olin understood the importance of getting us our first home and followed up on all angles. He kept us informed, educated us on the process and his wonderful sense of humor made it fun to work with him. He continues to follow up with us and we cant thank him enough!" "Working with Olin Eargle and Brian Felder, was truly a pleasure and helped to reduce the anxiety associated with a home buying process. From the very beginning they were dedicated to assisting us in finding a home. They helped to educate us on the market and how it shapes our buying capabilities. Both individuals were caring, detail-oriented and extremely patient in the process. Since my wife and I had extremely conflicting schedules, Olin and Brian arranged for us to see several sites in a very short time span, and devoted an entire weekend just to our home-buying needs. It was extremely selfless of them to work around our schedule like that. As far as finding actual homes, they enabled us to be in the cockpit so to speak, and gave us unlimited options in regards to location, price points, and amenities. They truly tried to get to know us, and come together towards finding an ideal home, rather than pigeon-holing us based upon their own assumptions. The process was professional, reliable, and downright refreshing. As far as the loan payment went, they gave us great resources to affordable lenders. Again, I must emphasize that the enormity of options available to us in this regard and the flexibility. We thoroughly enjoyed working with both of these consummate professionals, and would highly recommend them to first-home buyers and seasoned veterans." "Working with Brian and Olin made the hunt for our first home a success, largely due to the their combined expertise and positive attitudes. What we enjoyed most about working with them was the team dynamic, each outing alternating between the two. 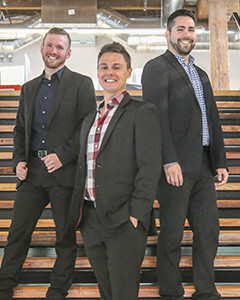 Each of them bring something different to the real estate experience, but they both offer up sound opinions, full knowledge of neighborhoods, and an open mind. We never felt pressured - in fact, in each and every property, we were all very honest about our opinions and views and able to have discussions about the pros and cons. They were both able to answer any and all questions we had about the homes, their locations, and the recent activity. Additionally, they offered valuable advice on how to structure our home search, even bringing us into the office one evening to set up a very specialized search. And it worked! They are a fun and engaging duo, making the process much less arduous. I highly recommend working with Brian and Olin, and intend to again...however, they found us the perfect home for many years to come!" "Olin and Brian were a dream to work with as a first time home-buyer. I had a vague idea of what my perfect (and affordable) home looked like; through their patience, expertise, and a vast wealth of information from the @properties website, I was able to easily find my dream home. I have no regrets working with them. They make a great team - Olin accompanied me on most of my showings and Brian worked closely with the paperwork. You could tell that they were always in open communication with each other; the three of us moved forward quickly and efficiently throughout the process. Their excitement and upbeat attitude made home-buying relaxing, organized and pain-free. I highly recommend them as Realtors! Now if only they helped move some boxes..."
""I have known Olin for several years socially and only recently employed his services as my real estate agent. I knew from our social interactions that Olin was a hard worker, dedicated to developing his friendships and was highly dependable. Not only does he represent those characteristics in our professional relationship he also can be counted on to deliver positive results, effective and timely communications and a great experience.Olin has worked with my partner and me for about a year in our home buying search. He was keen on helping us to identify our musts and prioritizing what we valued in a home. His attention to detail and diligence in preparing us for the process has made this a very smooth and enjoyable one. Recently we found, or should I say Olin found, the place where we plan on calling home for many years.Throughout the process Olin has been available to answer any questions and his pro-active approach toward us led to many questions being answered well in advance of us actually asking them. This kind of service is rare to find and indicates how in tune Olin is with his clients and their needs/wants.I would highly recommend Olin to anyone who is looking to either purchase a home or sell their home (or both). With Olin you can count on top notch service, keen attention to detail, honest and forthcoming communications and an all around wonderful experience. Purchasing or selling a home is very stressful and Olin works hard to ensure that the stress is reduced and the end result is positive. When we decide to sell and purchase again, Olin will be our agent."" "As a first time home buyer, Brian and Olin were wonderful in regards to finding a place that met nearly all my criteria. They truly listened to what I needed, and both went above and beyond to find it for me. While they offered their personal opinions if asked, they allowed the condo to speak for itself and let me make the decision. Brian and Olin are both very patient and professional real estate agents." "Being a first time homebuyer, I had a lot to learn. Olin was always there to answers my questions and happy to help with anything I needed. He worked very hard searching for exactly what I wanted. Once I found my new home, Olin was diligent in making sure I understood all the documents and paperwork, overall making a complicated and stressful process easier In the end, I am very happy with my new home and would recommend Olin to anyone looking for agent." "Olin is very helpful in answering all questions and staying on top of the process, as we negotiate the contract and navigate a very challenging closing. He is personable, professional and knowledgeable." "Olin Eargle is a passionate and very knowledgeable asset to have on your side when looking for a new residence. I would highly recommend him to anyone in need of his services. He works with your schedule. Communication is a breeze as Olin has no issues speaking over the phone, text, or email. For my next move, I'm definitely giving Olin a call again." "OLIN DID A FANTASTIC JOB AND WAS EXTREMELY PUNCTUAL AND TIMELY IN HIS COMMUNICATION WITH ME, THE OUTGOING TENANTS AND THE NEW TENANTS. HE RENTED THE UNIT IN 1-2 WEEKS." ""I could not have had a better experience selling our home thanks to Olin. He is extremely knowledgeable and gave us such good advice, from properly staging our home to advising us on the best selling price. As a result, we had a buyer in a competitive market in less than a week. Not only is he a true professional, but he also very accessible and really goes the extra mile in communicating with the other agent, our attorney, and others involved in the sale. He is also very savvy with the marketing strategies on the web and works with the best professionals like photographers and brochure designers. He is simply the best!"" "Mr. Catalan provided superior service in my pursuit to find a suitable two bedroom satisfying 99.9% of what I hoped to have in my next apartment. Endlessly professional, charming, and persistent in finding the perfect apartment during my search!" ""Olin sold our old condo and helped us purchase our new one. Having not known much about the current state of the housing market, Olin guided us through getting our condo prepped to sell. He was excellent at pointing out what needed to be fixed and got us a very good offer with our condo being on the market for only one day. He advised us to look north for more affordable housing and we found the perfect place to purchase that gave us 3 times the room. The seller's side had some people who were very difficult to work with however. Olin and our attorney spent late nights negotiating to make sure they accepted our terms and got the deal through. Olin has a decade of experience in real estate and the Chicago market. It proved necessary to make everything work."" ""Olin has helped us buy and sell a home in Uptown/Edgewater. He's incredibly responsive, savvy, and amiable. He also gives excellent recommendations regarding mortgage brokers, attorneys, etc., We wouldn't choose another realtor if you paid us!"" "Luis was awesome and helpful every step of the way. He went above and beyond my expectation and was truly a genuine human being to work with. I'd highly recommend Luis to anyone who is looking for a professional and courteous broker."